During the months of November and December, Oldcastle Infrastructure companies in Tennessee, Kentucky and Candiac, Quebec sponsored food drives for local food banks. The food and hygiene products collected will help many families in need during the holiday season and after. The food banks that received donations included Joseph’s Storehouse Food Ministry of Lebanon, Tenn. and La Corne d’Abondance of Candiac of Quebec. 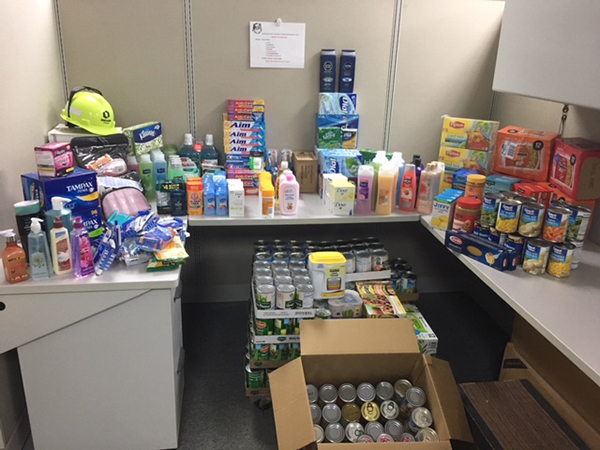 Joseph’s Storehouse received essential hygiene products, canned and dried food goods from Oldcastle Infrastructure Lebanon, TN and Lexington, KY employees who hosted the food drive. Joseph’s Storehouse Food Ministry is a non‐profit, faith‐based food ministry distributing assistance to an average of 400‐ 500 families per month in Wilson, Trousdale, Smith and DeKalb Counties of TN. Oldcastle Enclosures donated non‐perishable food to La Corne d’Abondance of Candiac who manages the Guignolée for the Candiac community. With the dream of putting food on the tables of the needy, employees collected food items during November and December for use during the holiday season and after. Composed only of volunteers, the La Corne d’Abondance of Candiac runs a shop (thrift and various items) open to all, a food counter and a bazaar. Profits financially support families in need of Candiac.